Job 13:15 - (NKJV): "Though He slay me, yet will I trust Him. Even so, I will defend my own ways before Him." "It's not fair", the child screams, when he loses at a game. "Who told you life was fair?" asked the adult who was helping them play the game. The child looks at the adult, and starts trying to say something, but can't get it out. Life's not fair, and now that the child has heard it, the child knows that it is true. Yet, the child has heard teachers, parents, friends, pretty much the whole of society saying that life was fair. it's like a robot saying, "beep beep, this does not compute." Life is NOT fair. Worse, God's not fair either. If he was, either everyone would be saved from their sin, or no one would be. But that is not the way it works. He does indeed call each of us to salvation, but that's it. Past that point, we have to answer the call. If we don't answer, no salvation. Even so, why should he. My Christian friends keep pointing out that you can forgive a crime against you, but the person who committed the crime still has to pay the price. That paying the price is fair. Yet, I did not pay the price for my salvation; Jesus did. Not fair. Not fair, and I am very happy that it is not fair. You can, however, say that God is Just. In that light, this verse from Job really rocks. What is happening to him is not fair. Yet Job does not turn from God. No, he argues with God, and God allows him to, for the sake of justice. 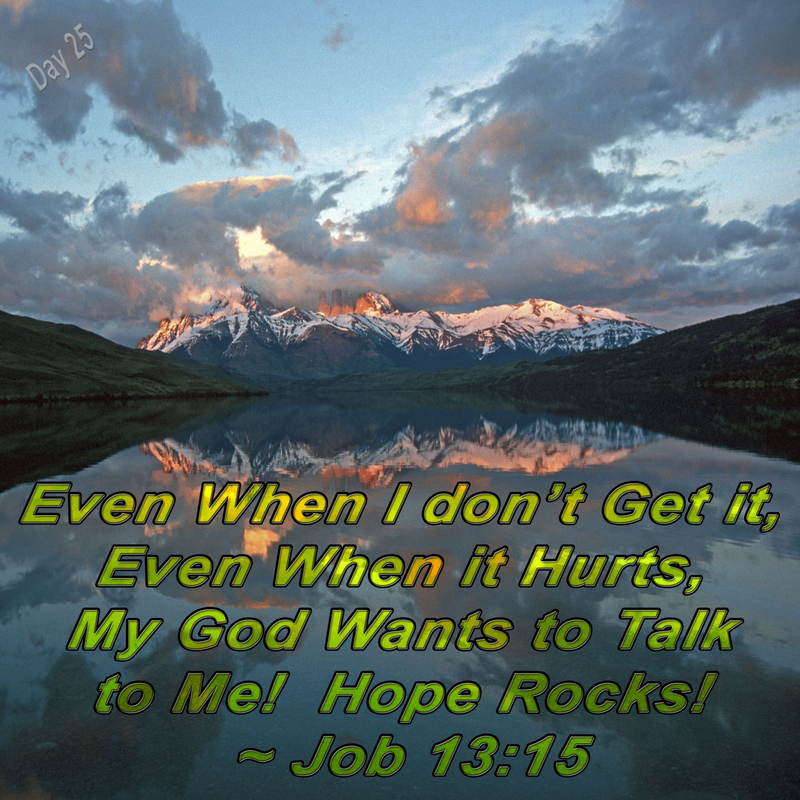 Job knows that God is just, and he knows he might die, as he searches for the sin he thinks he must have committed to cause his troubles, but he refused to give up on his faith in God. Everything is taken from him, but he refused to give in or give up. He thinks God is fair. But we know the story. It is NOT God doing these horrible things to him, but rather Satan. Satan is not fair either. Yet, we also know that at the end of the story, Job gets it all back, plus much much more. Why? Because God is Just. He makes up for the unfairness of the situation. He is in control, and Job held on to his faith, refusing to give up or give in. That's hope. Even in the middle of unfairness, your faith in God's Justice will be rewarded. Hang on. God is already in the house.